When a rogue cult turns deadly, the authorities call on former conman Agent Saul Marshall. Drawn into a cat and mouse chase with the leader of the cult Ivan Drexler, news arrives that he has taken Marshall’s son hostage. Removed from the line of duty, Marshall must work alone, off-grid. As the attacks intensify, Saul will stop at nothing to defeat Drexler. But people are questioning Saul’s own part in the carnage. He must work fast to save both his country and his son. I took far too long to get around to reading False Prophet but once I started to read it, I really couldn't put it down and it turned out to be a very quick, riveting read. Saul Marshall is such a multi-faceted character; he's a con-man turned FBI agent so he knows more than most how the criminal mind works, basically because he has a criminal mind himself. The prologue will not fail to hook every single reader that turns the first page of False Prophet. Imagine sitting down to breakfast with your morning newspaper and seeing your obituary in the paper. That's what happened to Aaron Woolf, who then received a phone call from his missing son rapidly followed by masked men entering his apartment to stage his apparent suicide. Saul Marshall has something in common with Aaron Woolf; his son, Samuel, has gone missing too. As Saul races to save his son, he uncovers something bigger than he could ever have imagined. 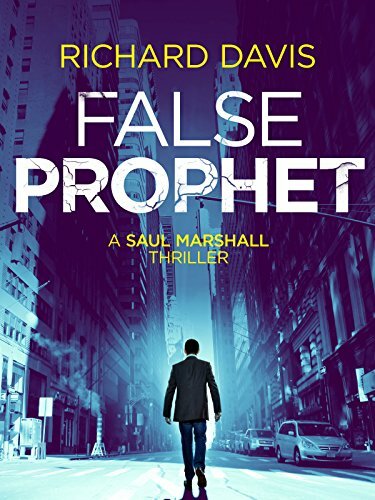 False Prophet is an absolutely stonking first thriller from Richard Davis and a fast-paced rollercoaster of a read; I think I held my breath several times during the book and almost forgot to breathe at the heart-stopping finale. It certainly gets you thinking as the story links to the 20th anniversary of the first World Trade Center bombing in 1993 and the 40th anniversary of the 1973 failed bomb plot codenamed Tribomb. It's a brilliant idea, and one probably very true to life, to have a false prophet using religion to 'cash in' on the jihadi mentality of willing suicide bombers. Are these islamic militants really any different to religious cult leaders? 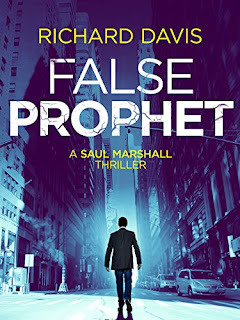 With a character as strong and flawed as Saul Marshall, Richard Davis is definitely on to a winner here. I was so eager to read more of Saul's story that I immediately went on to read the next book in the series, Never Forget.